A trip to Seattle means shopping, eating and meeting up with Goose and Mother Goose. Former residents of Vancouver, now transplanted into Bellevue, they visit every now and then. So it's a bit of a role reversal when we visit them. We decided to go for dinner the first night we were there. Some ideas were floated around such as Cheesecake Factory, Claim Jumper, Red Lobster etc... Yah, they're all chain restaurants - been there, done that. However, they all offer something a little for everyone and are kid-friendly. But Goose wanted to try something else and suggested a nearby Asian buffet. Alright, when those words rolled off his tongue, I immediately went into "I'm not going to eat at an Asian buffet in Bellevue" mode. Yah, we're from Vancouver, where Asian food is pretty darn good for North American standards. So let me see, you want me to eat Asian food in Bellevue and it's going to be in a buffet format. Are you nuts??? I seriously was wondering if Goose had lost his marbles. Images of Dragon Inn and their infamous smorgasbord started dancing in my head. That's right, dancing spring rolls, chop suey and fried chicken balls were frighteningly appearing in my sights. I wanted to run, run all the way back to Vancouver. But wait. Goose has a good hold of Asian food. He did say that some people have told him that it was decent for the money. Oh alright, I'll give it a shot. What's there to lose? My appetite... But there are not many things I won't eat. 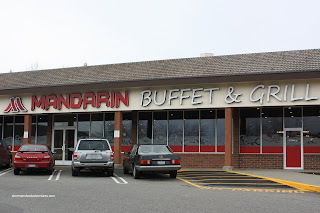 So off we went to Mandarin Buffet & Grill. Which happened to be right across the freeway from where we were staying. Conveniently located in a strip mall right next to a Safeway, the restaurant is relatively hidden from street traffic. Apparently, there have been about 3 other restaurants that have come and gone at this location. I guess we'll see what happens to the buffet... For a Thursday night, the place was hopping with lots of customers. Alright, that is a good sign. Full house = fast turnover of food. Another good sign was the pricing. At $12.99 for adults Monday thru Thursday and $13.99 on weekends, it seemed quite reasonable. Weekday lunch is probably the best deal at $8.99. For kiddies, I like the pricing where they charge by year from ages 3-11. 55 cents for lunch and 65 cents for dinner. After we sat down, I went to take a look at the offerings from their... count >them... 7 stations! I was overwhelmed by the massive quantity and selection of food. 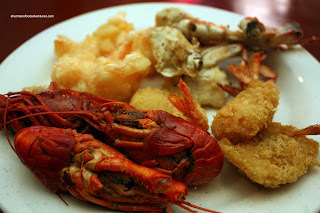 In the first section I visited, there was 2 types of fried shrimp, mussels, crab, shortribs, fries, sesame balls, garlic bread and frog legs. The second section consisted of North American Chinese food such as broccoli beef, General Tso's chicken, sweet n sour chicken, pizza, stir fried asparagus, baked mussels, fried rice, fried noodles and a few other stir fries. On the end were a selection of 3 soups. 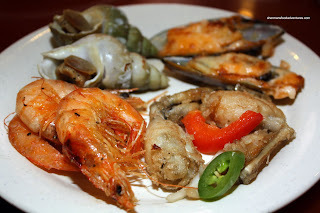 The next section was a mishmash of items such as crayfish, clams, sea snails, fried whole shrimp and a few other stir fries. Directly in the centre of the place is a Teppanyaki grill doubling as a Mongolian grill. Right next to it is an actual grill for steaks. Yes, you heard me right, in addition to the usual items you'd find at a Mongolian grill, there were full sirloin steaks. They are grilled to your liking right in front of you! The items at this station included beef, chicken, pork, shrimp, sirloin steaks, sprouts, broccoli, cabbage, mushrooms, noodles and snap peas. If this sounds a lot like U-Grill, it is and imagine that, you'd probably spend $13.00 there anyways! Directly behind the grill station is the Japanese themed section with grilled squid, fish and tempura. 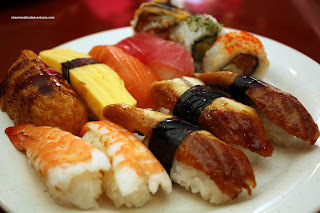 There is also a selection of rolls and nigiri sushi. 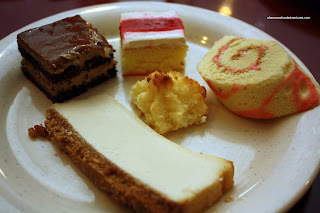 2 more stations consisting of the salad bar and desserts (which were pretty weak except for the cheesecake) are to the side of the Japanese section. Highlights from this area include oysters on the half shell, seaweed, grilled asparagus, lychees (canned, but good) and fresh fruit. Wait, there is more! Last item is the soft-serve ice cream station with sprinkles and nuts. Yah, it's a buffet on steroids that would put the defunct Foodie Goodie to shame. Okay, now the food wasn't outstanding; but it was more than edible. I came in with real expectations for the price and venue. Of course a buffet is never the right situation to experience great food and honestly, most buffets will never advertise that. Thus, I was only expecting acceptable food. 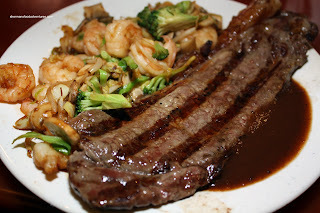 The highlights had to be the grilled to order sirloin steaks and the Mongolian grill. The clams were good and so were the frog legs. I was not impressed with the oysters or crayfish, they didn't seem fresh. Although the sushi rice was pretty much a joke, the fish itself was half-decent. 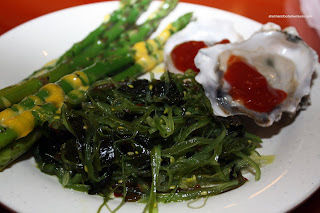 I really liked the seaweed and took lots. 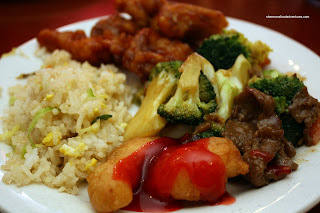 The North American Chinese food was pretty much what you'd find at Panda Express; but that is to expected. I did like the freshness of the veggies in all of the stations. It also helped that there was high turnover of the food. So the food wasn't great; yet it was pretty good for what it's worth, especially for the price. I wouldn't recommend it if you wanted quality food; however, if you wanted to get full while having an enormous variety of food, this is your place. - Sweet strawberry glaze over bananas? WTH? alls i can say is, i see crawfish!!! on a side note, Blue Fin has pretty awesome AYCE. It's by Northgate Mall just north of Seattle. And get this, there's a girl who spins cotton candy at the dessert station! sweeeet! LOL Jennifer... Actually, we were deciding whether to go to Blue Fin or not. I heard about the cotton candy! Would've been good for the kiddies. i went very recently and took tons of pictures! 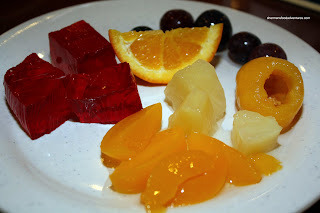 food is pretty fresh, not bad on variety and taste is good! seriously...vancouver needs to get on the better-asian-ayce boat! "The American know their buffet! :)"